American Honda Motor Co., Inc. today reported March 2015 Honda and Acura vehicle sales of 126,293 units, with Honda trucks gaining 0.8 percent on sales of 51,516 units, while overall sales decreased 5.3 percent versus March 2014. 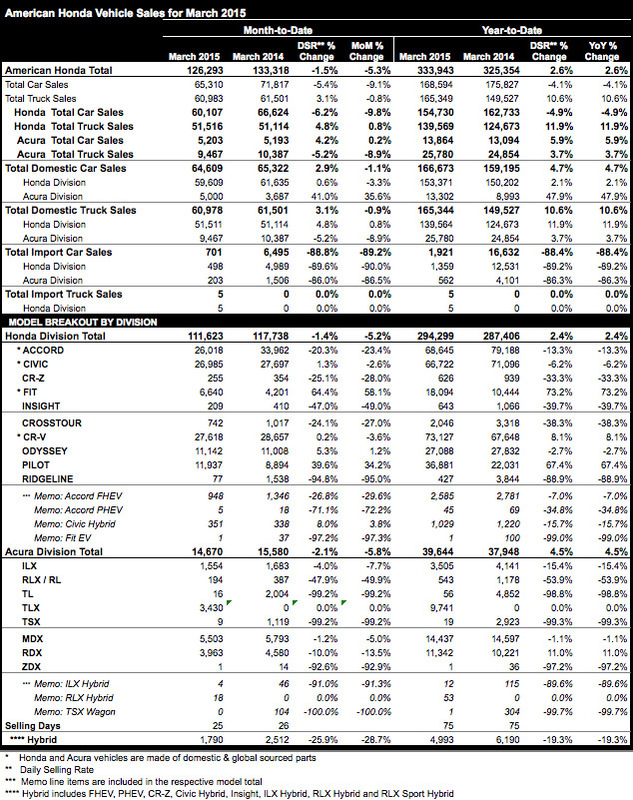 The Honda Division sold 111,623 vehicles in March, a decrease of 5.2 percent for the month. The Acura brand posted sales of 14,670 units, down 5.8 percent over the same period last year. With consumers showing a growing appetite for light trucks, the Honda CR-V and Pilot continue to set a blistering sales pace, soon to be joined this spring by the new gateway crossover, the 2016 Honda HR-V. The Fit is also maintaining tremendous momentum, gaining 58 percent over March of last year. 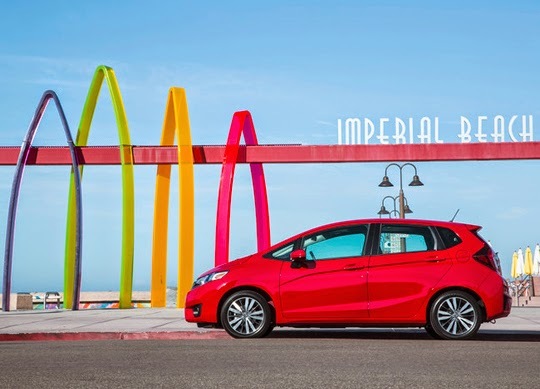 Honda Fit had another big month, rising 58 percent on sales of 6,640 units while jumping 73.2 percent for the first three months of 2015. Sales of the best-selling CR-V crested 27,000 units in March. The Pilot had another strong month posting sales of 11,937 vehicles, an increase of 34.2 percent, helping build momentum for the all-new 2016 Pilot coming this summer. Total Honda truck sales were up 0.8 percent in March. "With the best-selling CR-V continuing to set the industry pace for SUVs and a brand-new HR-V and Pilot on the way, we're in a great position to take advantage of the market shift toward trucks," said Jeff Conrad, Honda Division senior vice president and general manager. "We're also pleased with the stellar growth of Fit sales and the continued strength of our entire passenger car lineup." Acura posted a month over month sales gain as trucks continue to set the pace for the luxury SUV segment. Acura sedans continue to build momentum, led by the TLX and the redesigned, repowered ILX, which is just arriving at dealerships nationwide. Total Acura sales are up 4.5 percent through the first quarter of 2015. TLX notched its third straight month-over-month increase with sales of 3,430 in March. MDX and RDX maintained a solid pace as total sales surpassed 9,400 units, even as significantly enhanced versions of each come to market. "The continued leadership of the MDX and RDX in the luxury SUV segment demonstrates the positive direction we are taking with our Acura product lineup," said Mike Accavitti, Acura Division senior vice president and general manager. "As we turn our attention to strengthening our lineup of Acura sedans, we are buoyed by the first Pirelli World Challenge series victory of the Acura TLX GT race car as a sign of good things to come."